My favorite posts this week were super long but i loved rememeber everythign I was writing about! After watching yet another friend's marriage fall apart this month, I posted this week on dangerous behaviors to avoid to help prevent affairs. I left my recipe for Saucepan Popcorn. It is a great back to school snack and healthy! 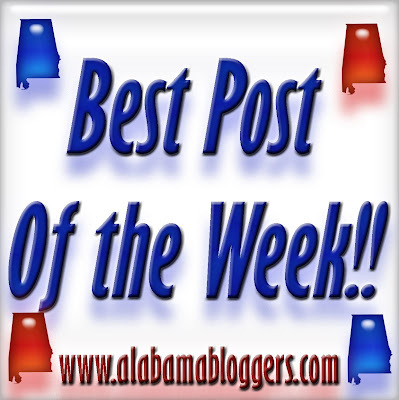 My post is about how your Driver's License weight is really an approximation. 5. Magic City Post - If you're headed to the Sidewalk Moving Picture Festival in Birmingham this weekend, here's our comprehensive guide to all of it. 6. Birmingham Blogging Academy - Is blogging writing? I bet many of you don't consider yourselves to be writers. You're probably wrong. This post was the result of a video sent to me by a high school classmate. Yes, I graduated before many of you were born. My 'best' post this week was a tour of my local bead shop and some pictures from the class I took there. Finished my Tulips stained glass project! The Greek girl is trying to scrounge up some votes to win a Tempur-Pedic Mattres over at the We Are THAT Family blog.